During the meetings in Edinburgh (Oct 1992, GB) and Ettelbruck (Jan 1993, LU) the pioneers of EUROPEA formed and accepted the first Statutes of our network, and in the second half of 1993 the official recognition was enthusiastically awaited. On the very day of 28thSept 1993, the certifying Royal Decree and the EUROPEA Statutes were published in Moniteur Belge, the official journal of the Kingdom of Belgium. 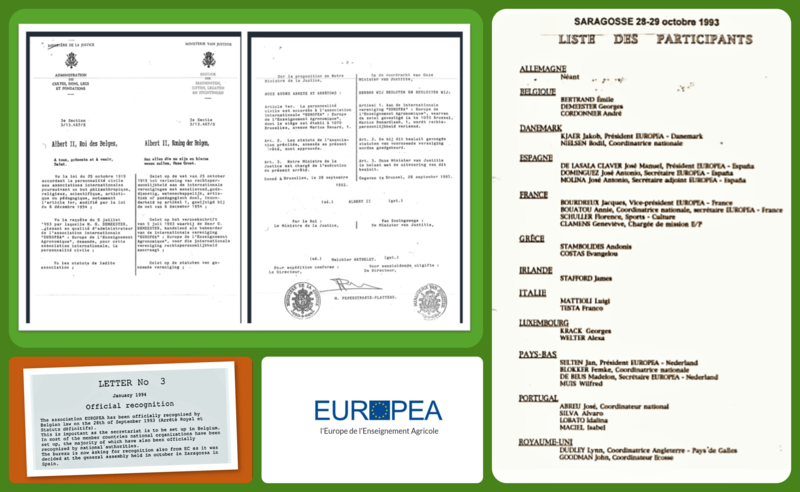 With this legal act EUROPEA was officially acknowledged and established. Alive and kicking! Only a few years after the initial Carrefour reunion in Normandy in 1988, EUROPEA – as a newly recognised association – was ready for future challenges and about to launch a wide cooperation within the field of European land-based education and training.